You'll have to forgive my late posting today, since I was out having some much needed "girl time" with a great friend. 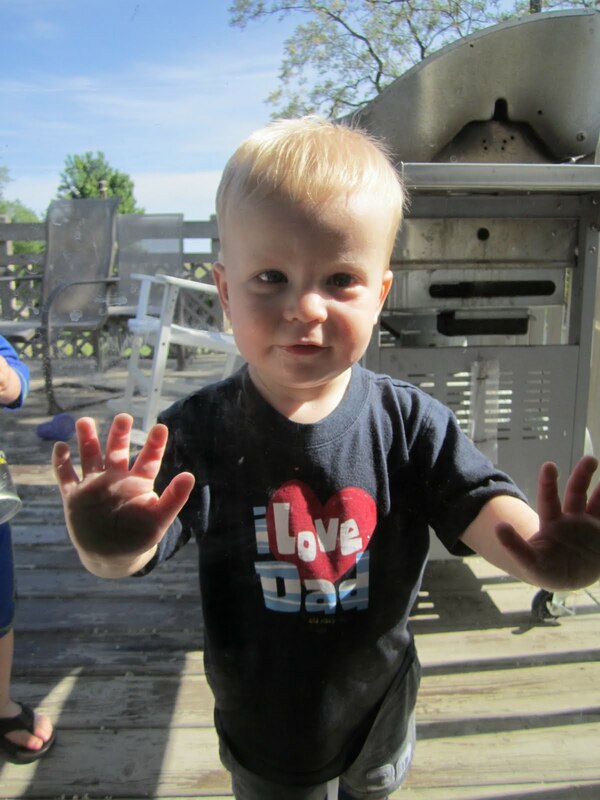 As I pulled away from the house, Graham pressed his tiny nose against the front door and watched us leave. He was probably confused, as me leaving the house without the boys OR Daddy is a rarity. So rare, in fact, that it's only happened twice in his lifetime. Cael didn't accept this new reality quite as seamlessly. It was obvious that he was confused and thought I was breaking the rules somehow. "Okay, Cael. Be a good boy for Daddy. I'll see you in a little bit when I get home." "But, Mommy, where are you going?" "I'm going into town. I'll be back after your nap." "Nope, she's going with me. You're going to stay with Daddy." "But Mommy, you can't leave without me!" "It's okay, Cael. I'm coming back in just a bit. You'll have a good time." "No, I won't, Mommy. You have to follow directions!!" There are so many of these times as parents when your children regurgitate phrases they hear you say on a regular basis (and others you wish they didn't hear you say) and you are forced to make a choice. Do I address this and demand an apology? Do I repeat the "There Are Certain Things Mommy Can Say That You Can't Say" speech? Follow it up with the "Mommy is the Parent" speech? Finish with the "Be Respectful of Adults" speech? (Being a parent will either make or break your organizational skills. I choose to catalogue my speeches in a 3-ring binder for safe-keeping). The other option is to let it go, knowing that none of the above speeches will be successful and plan to have another conversation about it later. This was my approach today. Probably not the smartest parenting move I've made, but Bridesmaids was waiting. And there's nothing like a raunchy comedy to wash the "Mommy" off of you for a few hours. When I arrived back home after a fun afternoon of Starbucks, pedicures and the movie, Cael had made it through the day. "I did! Did you have a good afternoon?" "I did. I played and I had meatballs and lima beans and chocolate and I took a nap. What did you do?" Same thing, dude. Exact same thing.